Maytag is a U.S. home and commercial appliance brand acquired by Whirlpool Corporation in 2006 (Source). ​They specialize in dryers, washing machines, cooktops, dishwashers, refrigerators, and ranges under the Jenn-Air, Amana, Maytag, and Magic Chef brands. Maytag fridges come in 4 different style configurations to adapt to your food-storage needs and space availability. Available in black, white or stainless steel, these fridges are designed to match the decor of the most common interior decors, all backed by a 10-year limited parts warranty. Maytag refrigerators are manufactured to exceed Energy Star standards, helping you save money on your energy costs (Source). *Read Whirlpool (who owns Maytag) explain their different fridge styles. 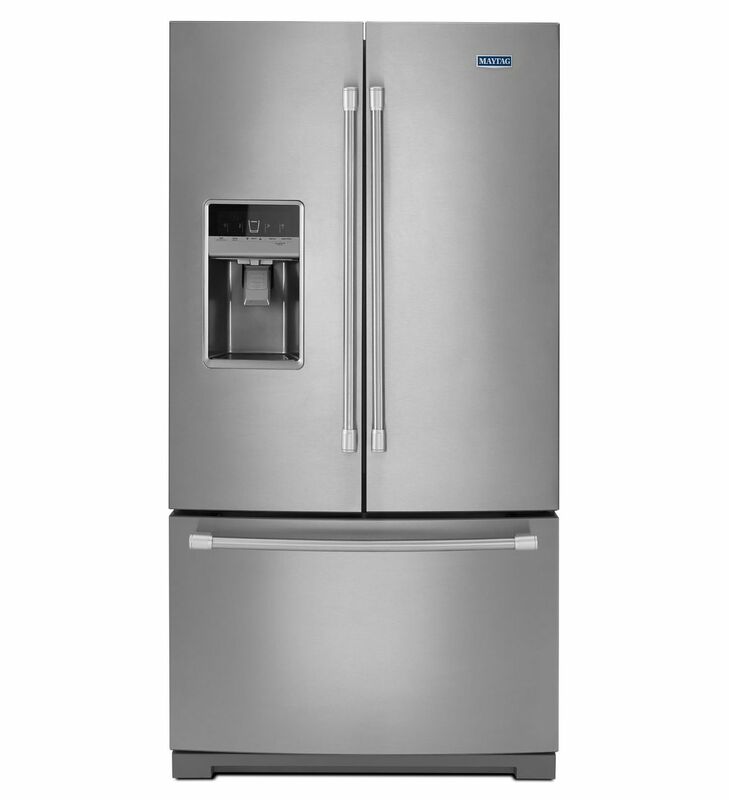 This Maytag French door fridge helps keep your food at eye-level. Through-the-door ice and water dispensers are optional. You can buy fingerprint-resistant colors in black, white as well as stainless steel. This side-by-side Maytag fridge has narrow doors, which means they don't swing very wide, providing you greater space-savings in your kitchen. Ice and water dispensers in every model are standard. The bottom freezer style opens either to the right or to the left. The lower freezer gives you solid visibility while placing common fridge contents at eye level. The top-freezer style is a classic look- letting you stare right into your freezer, at eye-level. You can get them in right or left-opening options. As well, the fridges can be fit in smaller, 30" wide kitchen cutouts. 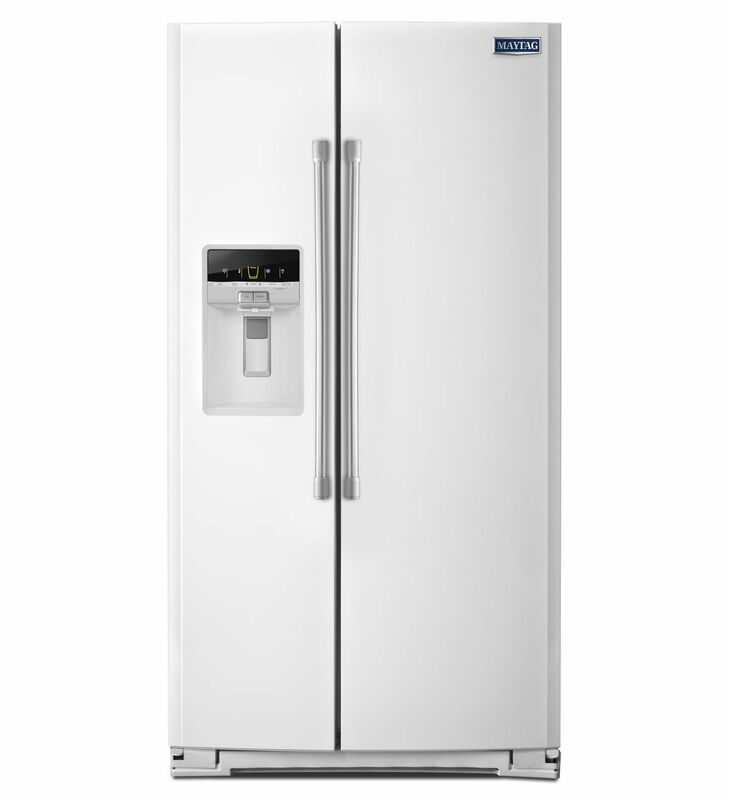 This 36-inch wide Maytag refrigerator is well-designed, practical, and it has a lot of storage space available. Users love the extra shelves, but some do note that it’s noisier than they anticipated. This French door refrigerator features five steel shelves, 26 cu ft of space, an adjustable temperature drawer, an EasySlide bin, and an under-shelf LED lighting. It also has dual cool evaporators, a store-n-door ice dispensing system, an auto humidity FreshLock, and a PowerCold feature that cools your food quickly. The Maytag refrigerators are designed and manufacture in the USA. In general, users have a high opinion of the Maytag refrigerator with steel shelves, and they praise its capacity, performance, and functionality. 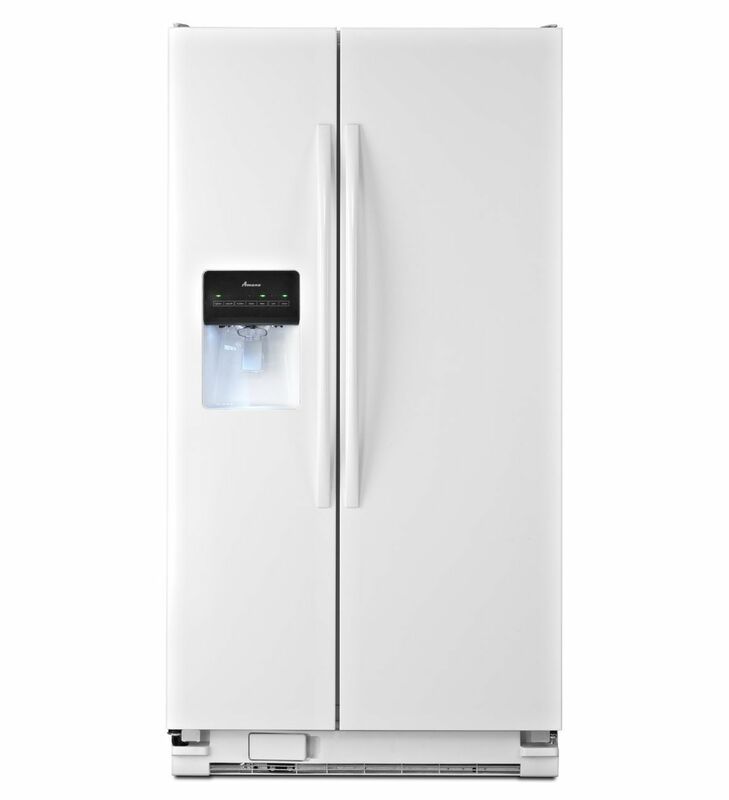 A buyer comments that the Maytag fridge holds tons of foods and that he likes the adjustable shelves and the ice maker. Another customer mentions that fourth door is extremely convenient and that the refrigerator is ideal for fitting large items like casseroles and cakes. The reviewer adds that the fridge is heavy-duty and spacious, but he warns that it’s quite large and advises that you make sure you have enough space in your kitchen. A purchaser shares that the pull-out drawers are practical and that the electronics is easy to figure out and you could set the temperature quickly. However, some customers have complained that the Maytag refrigerator arrived broken or that it stopped keeping food cool after several months of use. A buyer also states that the ice maker chews the cubes. This 33-inch side-by-side refrigerator offered by Maytag is large, spacious and an excellent choice for keeping your fruits and vegetables cool. Users love the adjustable shelves, but some do note that they had problems with the ice maker. 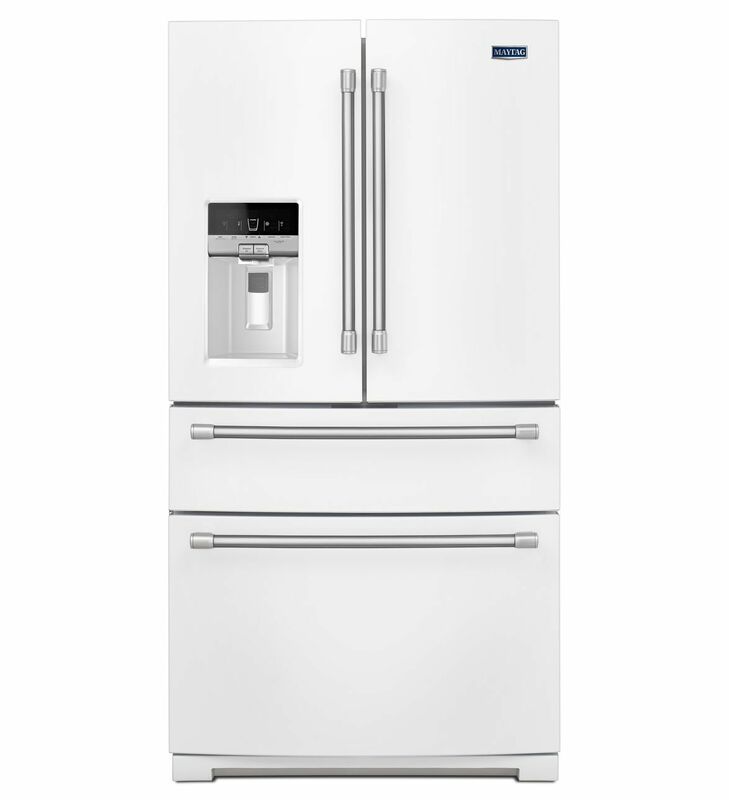 This Maytag fridge features 21 cu ft of storage space, adjustable glass shelves, an ice and filtered water dispenser, a bright white LED light, and humidity controlled crispers to keep your food fresh. The Maytag fridge measures 33” x 35” x 66 1/8”, and it also has gallon door bins, a fresh flow preserver, and a freezer capacity of 6.77 cu ft.
A buyer comments that he is extremely satisfied with the storage capacity of the side-by-side fridge and that it’s perfect for his small place. The reviewer also adds that the stainless steel design makes it very easy to clean it. Another happy purchaser says that the fridge does an excellent job of keeping his food frozen and that the LED light is bright and convenient. A satisfied user also shares that he had the Maytag refrigerator for two months and that he doesn’t have any complaints or issues with it. He highly recommends it. However, some customers have complained that the refrigerator’s door doesn’t line with the freezer door and that the freezer is smaller than they expected. Some also note that the fridge makes a lot of noise and that they had to have it repaired several times. This 36-inch side-by-side refrigerator offered by Maytag is well-made, durable and suitable for any kitchen. Users love that the fridge is spacious, but some no note that the shelves are not adjustable. This counter depth refrigerator measures 35 ¾” x 30-13/16” x 68-7/8”, and it has a capacity of 20. 59 cu ft. It features stainless steel handles, gallon door bins, a store-n-door ice dispensing system, a bright LED light, and a fresh- flow preserver. The refrigerator comes with a ten year limited warranty and humidity-controlled crispers. The counter depth design makes it easy to fit the fridge in any kitchen without redecorating. A customer mentions that the Maytag counter depth fridge has more space than his old refrigerator and that after he had transferred his food, he had plenty of room to spare. The reviewer adds that the fridge works quietly and that it’s easy to clean it with mild soap and water. Another happy user comments that the shelves are adequately spaced and that it’s simple to operate the ice maker in the door. He highly recommends it to anyone looking for a reliable refrigerator. However, some customers have complained that ice flies everywhere when they use the ice dispenser and that they prefer to take the ice out by hand. Some users also note that the storage space is not enough and that it’s hard to clean anything off the finish. If you are looking for a top-notch side-by-side refrigerator, you might take a look at the Amana 35.5-inch wide fridge. Users love the design and the size, but some do note that they have problems with the shelves. 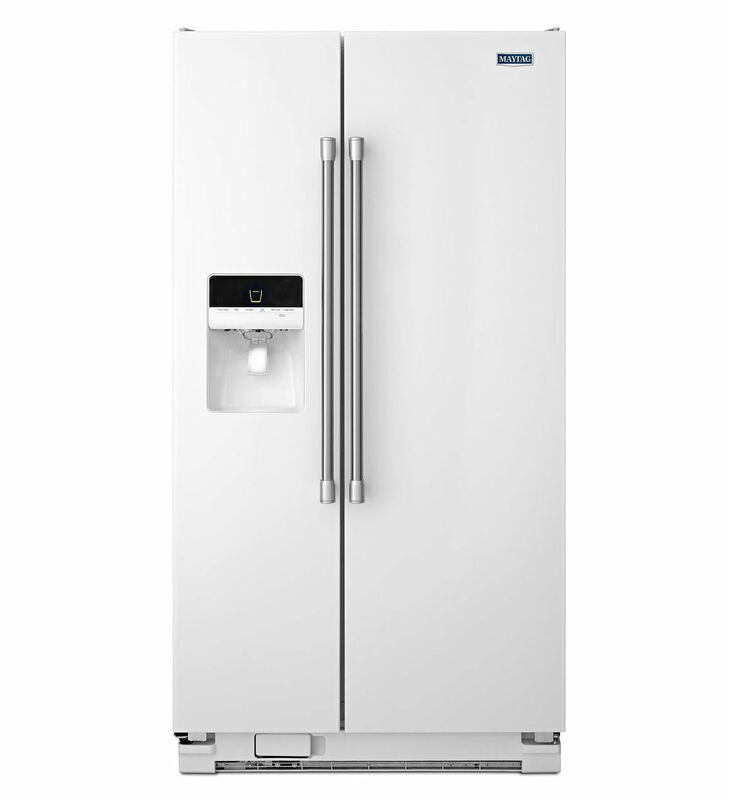 The Amana fridge measures 35 ½ x 34 5/8 x 68 7/8 inches, and it has a 24 cu ft capacity. The refrigerator features three SpillSaver shelves, adjustable door bins, gallon door storage bins and a dairy center for easy access to your dairy products. There is also an external ice and water dispenser, temp controls and a dispenser control lockout. A buyer comments that he has been using the Amana refrigerator for years without any issues or complaints and that thanks to it he has a low electric bill. He highly recommends as the best side-by-side refrigerator. Another user mentions that he bought this fridge two months ago and that he is extremely satisfied with its performance. He shares that the Amana fridge works quietly and that it provides cooling water quickly. A reviewer states that it’s easy to clean the shelves and that it’s perfect for limited spaces. However, some customers have complained that the doors are not the same height and that the ice maker spews ice everywhere. Some users also note that the displays are dark and hard to read and that there is not a cheese drawer present. This 33-inch wide refrigerator offered by Maytag is spacious, innovative and an excellent choice if you want a long-lasting fridge. Users love that the fridge works quietly, but some do note that it’s overpriced. The Maytag measures 32 ¾ x 34 3/8 x 66 ¼ inches, and it features stainless steel handles, electronic temperature controls, a capacity of 21 cu ft, and a bright white LED light. The top refrigerator also has an EvanAir cooling tower to keep the food cool, a PowerCold feature for quick cooling, gallon door bins, humidity-controlled crispers and a 10-year limited warranty. A buyer comments that he has owned the Maytag top freezer only for a couple of months, but he is very impressed with its quality and design. The reviewer says that there is enough space to store all the food you want and that he likes the full-width drawer. 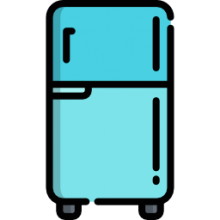 Another user adds that the fridge works quietly and after a month of use he doesn’t have any complaints regarding its performance. He highly recommends it to anyone looking for a spacious top refrigerator. However, some customers have complained that they received a defective product and that the fridge didn’t work properly at all. Some also note that ice started to form inside the refrigerator within days. What Are Maytag Buyers Saying? The first Maytag refrigerator we examined was this 36-inch wide, four-door fridge with 26 ft.³ of capacity. It features steel shelving, temperature-adjustable refrigerated drawers, and under-shelf LED lights to illuminate your fridge's interior (Source). One buyer we spoke with says that she has owned this fridge for over 15 years, commenting that it has been an exceptional mainstay of her kitchen, with a helpful manual and easily available Maytag replacement parts. She endorses the adjustable shelving and the extra-large capacity of the lower-level freezer. Another reviewer raves about it, saying that its extra drawer is a great area to store lunch meats and cheeses- keeping them readily accessible for her children's school meals. Other reviewers tell us that the dividers are easy to install and remove, adjusting so that you can divvy up the interior into handy storage compartments. They do note that the fridge has a tendency to make some strange noises, which Maytag says is on account of the compressor, but reviewers say that it is not an annoyance for them. 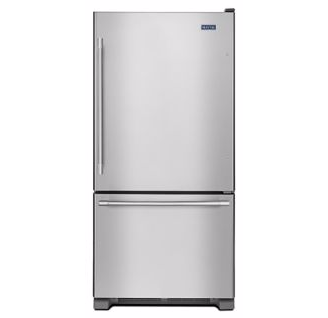 Another reviewer says that the ice cubes this Maytag refrigerator produces are on the small side- which might become a problem during the summertime, but the jury is still out on that. Another reviewer, who purchased the black, stainless steel refrigerator model, endorsed this Maytag refrigerator's LED lighting- saying that they are thoughtfully arrayed in the interior to help you find what you're looking for at night. 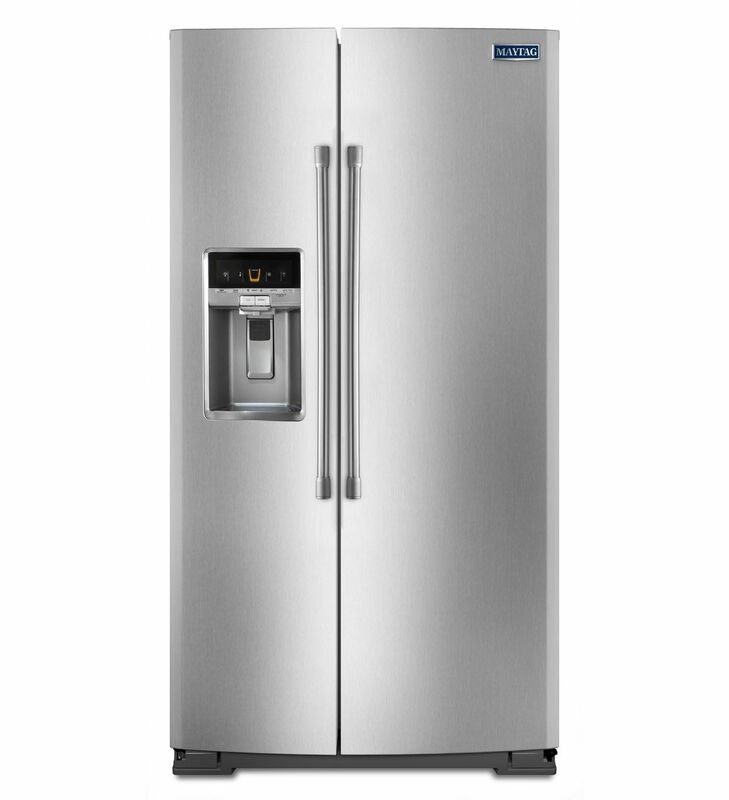 Another reviewer, initially searching for a side by side stainless steel refrigerator, told us that it is a heavy-duty option with gorgeous surfaces, but did confide that it is somewhat noisy, with a bunch of motor noises emanating from it. Another satisfied homeowner, who had been using an apartment-sized fridge, told us that they are satisfied with their purchase- saying that its interior and exterior design is well thought out. Like other reviewers, they endorse the extra middle drawer which they found to be an exceptional area to store cheeses, seltzer, soda cans and vegetables anything you need on hand in a pinch. They also recommended the capabilities of the ice maker, saying that it has worked well so far, letting you grab handfuls of ice without a hassle. However, the same homeowner did say that this Whirlpool refrigerator is a bit more expensive than other options, particularly see through fridges, but on the whole since you'll be living with it for probably more than a decade, it makes sense to indulgent and get a model that you will truly enjoy over the long-term. Another reviewer we interviewed was, overall, satisfied with this Maytag refrigerator, endorsing the look and feel of it steel shelving and the handiness of its extra middle drawer. One thing they wished for, is that there would be a bit more space for taller bottles, and sometimes they noticed that the vegetable drawer is a bit too humid. The second Whirlpool refrigerator we took a look at was the Maytag 33 inch side-by-the side refrigerator with 21 ft.³ of space. It features stainless steel handles, a 10-year limited parts warranty on its compressor, spacious gallon door bins, adjustable glass shelves in to help manage the interior space and keep it clean, as well as an external ice and water dispenser (Source). Buyers were impressed by the BrightSeries LED interior lighting and the FreshLock crisper that is humidity-controlled to ensure that fresh foods are effectively stored. Buyer feedback has been mixed for this Maytag refrigerator, with one reviewer telling us that instead of glass shelving, they received wire shelving. Additionally, this homeowner says that the quality of its exterior was substandard for a Maytag refrigerator- saying that there was an alignment issue with the refrigerator and freezer doors, with the refrigerator door jutting out 3/8 of an inch more than the freezer door. Another disappointed Maytag buyer told us that this Whirlpool refrigerator has struggled to maintain consistently cold temperatures- as well, he finds that the freezer is not as spacious as he thought it would be. Another common buyer complaint is that the ice maker makes a loud banging noise- this is incredibly annoying and several reviewers say that they would return this refrigerator to Maytag were it not for the extraordinary hassle of removing and replacing such a large item. On the other hand, a more recent purchaser, who was replacing a black stainless steel refrigerator, told us that aside from some relatively minor quibbles that it has worked well so far, though they have some issues with the default water temperature settings and the spacing of the wire shelves inside of the freezer. Another homeowner tells us that largely it has been effective, but one gripe they have is that the icemaker needs to be turned on or off manually because it has a tendency to overflow for it automatically turns itself off. Yet another reviewer we interviewed told us that while it's appearance is attractive, one significant issue is that its large drawers are very difficult to close- this makes it challenging for her children to access the refrigerator when they're looking for a snack. The third Maytag refrigerator we took a look at was the side-by-side Maytag refrigerator with 21 ft.³ of space. It features and indoor ice dispensing system, installing an ice bin directly into its refrigerator door. One reviewer we interviewed purchased this specific model because it was the only fridge that met their highly specific size and criteria (Source). One buyer who was replacing an old french door refrigerator told us that the icemaker is a disaster- when they try to dispense the ice it shoots out everywhere, even when you use the crushed ice setting. Another buyer told us that they had been in the market for a counter-depth Maytag refrigerator model- they recommend this one, saying that it's shelf spacing is engineered to allow storage of solar products like one containers and extra-large milk bottles. As opposed to one other reviewer we interviewed, who was debating 'french door vs side by side', another homebuyer told us that the in-door ice dispenser has worked well for them, creating greater storage capacity in the freezer. On the other hand, there have been some complaints about noise, with buyers saying that its standard 'hum' is louder than they expected, and can be heard over the noise from television in an adjacent living room. However, one condo buyer said that this particular refrigerator was part of the package and he has experience problems with its ice dispenser, which a Maytag repair man attributed to a clogged line. In addition its interior lighting has also malfunctioned and needed to be replaced. While buyers enjoy its side-by-side configuration, some reviewer's were disappointed with the way the shelves were outfitted, with a common theme being that the icemaker has had difficulty dispensing and effectively functioning over the long-term. The fourth Maytag refrigerator we examined was the 35.5 inch side-by-side refrigerator where 24 ft.³ capacity (Source). One buyer told us that the biggest issue they have is with its ice and water dispenser- the crushed ice setting causes ice to spew out all over your hands and kitchen floor unless you are extremely careful to hold your glass tight up against it. Another buyer, who swapped out a french door refrigerator, complained that their doors are not machined well- the fridge door, for example, was actually a quarter of an inch shorter at its handle than the freezer door. As well, buyers looking for apartment size fridges have noted that the corners of its stainless steel doors are pinched instead of being smoothly rounded or squared. Another homeowner told us that they were surprised that this refrigerator doesn't have a deli drawer- this is a singular inconvenience for this particular homeowner. On the other hand, another reviewer told us that they have been pretty satisfied with this refrigerator, saying that it is an attractive option with a spacious interior that maintains its temperature well. However, a newer Amana buyer told us that the drawers are flimsy, requiring some juggling to pull in and out- because they are made of a cheaper plastic that has a tendency to bend in the middle if you store larger items like watermelons inside of them. The last Maytag refrigerator we examined was the 33 inch, wide, top-freezer style, 21 ft.³ Maytag fridge. It's built with an interior cooling tower, interior LED lighting, humidity-controlled crispers, a 10-year limited parts warranty, and extra spacious gallon door bins (Source). When it comes to choosing a Maytag refrigerator, you want to consider whether you purchase a French Door, Side-by-Side or Top Freezer style. fridge. The advantage of the French door bottom freezer style is that it easily accommodates bulkier or wider items. It provides the best of a side-by-side as well as bottom-freezer configurations, keeping all of your refrigerator's contents at eye level. 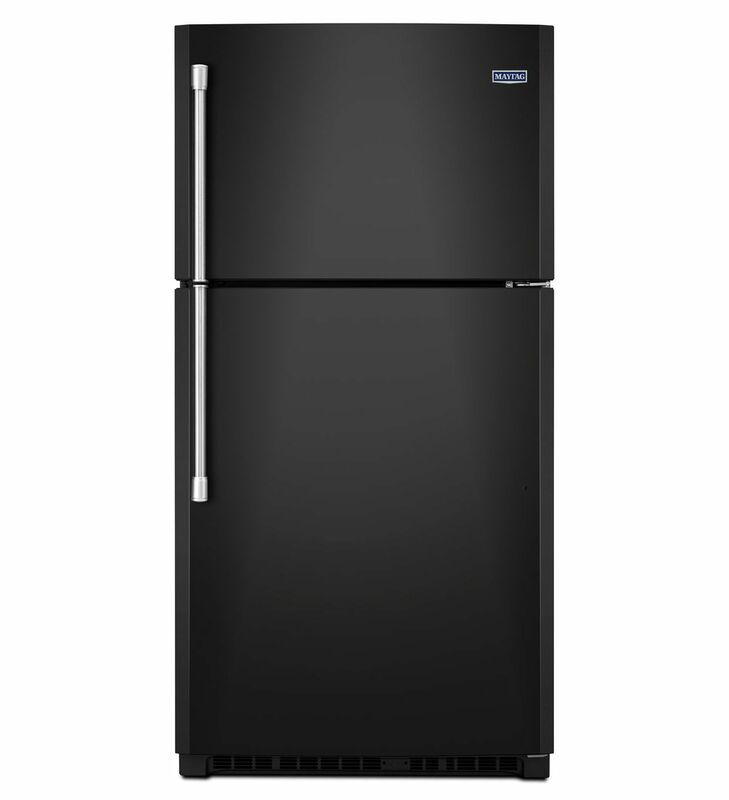 The Side-by-Side Maytag refrigerator includes a variety of different freezer capacity configurations with through-the-door water and ice dispenser options. The top freezer style is recommended by Maytag is the best value option, coming up with a solid selection of different fridge options as well as flexibly arranged beverage dispensers. As well, when it comes to purchasing a Maytag refrigerator, you'll want to consider the energy efficiency, how difficult disposing of your current refrigerator is, and how easy it will be to install your new Maytag option. Since refrigerators will be running all day long, it's an important energy cost that you'll need to consider when selecting the best option for your home. If you have an old fridge, particularly one manufactured before 1999, it's likely that they are not up to the current standards the Department of Energy provides as guidelines. A new Maytag refrigerator will likely be an upgrade in terms of energy efficiency, keeping in line with important energy regulation protocols as well as decreasing the size of your monthly energy bill. Maytag does offer haul away services- click here to read about some disposal options they provide. There are some important ancillary features when considering purchasing a Maytag refrigerator- these include whether or not the following are standard or add-ons: ice and water dispensers, water filters, sound insulation, stainless steel, & smudge-free finishes. In terms of the style of finish- Maytag refrigerators are available and stainless steel, white and black colors.